The strategies below are just some of many that can be used to help your child memorize and recall addition and subtraction facts. The guidance and practice exercises in this section have been graciously provided by Susan Greenwald, MA Ed. and are taken from her Two Plus Two is Not Five workbook. 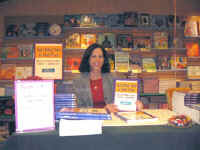 Learn more about Susan Greenwald here and the three books she has written on teaching math facts. Follow these steps to help your child memorize basic addition and subtraction facts using the tricks from Susan Greenwald's Two Plus Two Is Not Five workbook. First, test to see which facts your child knows. Then record them. Create a chart (you can use this addition chart to help) and mark any facts that are already known. Teach each trick to your child and use counters (e.g. buttons) to model the trick making sure your child understands the concept behind the trick. Practice at least three times a week. Each trick begins with it's introduction. Work through these with your child and then allow them to try the practice activities. Encourage your child to use the trick's name. This will help with recalling the trick and the related facts. Notice how each trick is followed by practice activities that cover the trick as well as activities from previously learned tricks; All facts are reviewed as new ones are learned. Work at whatever speed suits your child. Use the Math Fact cards on a daily basis to review facts. Note: Be sure your child can demonstrate the meaning of addition and subtraction before working on memorizing facts. What is one more? Write the greater numbers. Go up like an elevator. Practice Number +1 with your child. You can use this printable worksheet on which you can try the above steps as well as answer questions using the Number +1 trick. 1. Look at the examples below and then try this worksheet to practice more with the Number +1 trick. Look. These are the same. 2. After completing the worksheets you can use these flashcards to help review and memorize the +1 and 1+ facts. 1. Practice Doubles and Number +1 together on this printable basic facts worksheet. 2. Look at the two different ways above to write the same addition fact. Both ways mean the same thing. Remember this when you try this worksheet to practice Doubles and Number +1. 3. After completing the worksheet, print out and use these flashcards to help review and memorize some of the doubles facts. Write the number that is one less. Try this printable worksheet on which you can try the above steps on paper. Complete this worksheet to practice more with the Backwards 1 trick as well as with some of the tricks you have already learned. Print out and complete this worksheet to practice Backwards 1 and Number +1 together. After finishing both of the above worksheets you should print out these "- 1" flashcards to help review and memorize the math facts learned using the Backward 1 trick. Print out this addition and subtraction facts worksheet to try the questions above on paper and to practice using the Doubles and other tricks that you have learned so far. Try this worksheet to practice Doubles, Number +1 and Backwards 1. Look at the example below and notice how both are the same. Use this to help you complete this short addition worksheet. Once you have completed the above two short worksheets, try these questions to help you memorize math facts - this worksheet covers all the facts you have learned so far in this section. After finishing the three worksheets above you can print out these "adding zero " flashcards for review of the "adding zero" math facts. Try this worksheet and answer the questions above on paper as well as some questions on other Doubles and Backwards 1. After finishing the above worksheet, print out and try this Doubles and Zeros worksheet that also allows practice with all the tricks learned up until now. Include the 4 + 4 flashcard that was printed out when learning other Doubles when reviewing the math facts you have learned so far. Learn Doubles Subtraction. What are the missing numbers below? Print out and complete this worksheet to practice on paper with the above "missing number" questions. After finishing the "missing numbers" worksheet, you can work through this worksheet and practice more with Doubles Subtraction as well as with previously learned tricks. Having completed the above two worksheets, try this addition and subtraction review worksheet to practice all the tricks you have learned so far. Add these two math fact cards to your set and use them on a regular basis to help review and memorize these math facts. Try this worksheet to complete the above exercise, marking the numbers that are Right Next To Each Other and crossing out the ones that are not. After finishing the above exercise, try the Right Next To Each Other worksheet that also includes some review of the Backwards 1 and Number +1 tricks. Next, print out this worksheet to practice Right Next To Each Other along with all the other tricks learned so far. Use these eight math fact cards on a regular basis to help review and memorize these Right Next To Each Other math facts. What numbers are missing below? Follow these three steps to practice with Doubles Subtraction and to review some of previously learned tricks. Print out and try this doubles subtraction worksheet to practice on paper with the above "missing number" questions and also with Doubles and Right Next To Each Other questions. Work through this review worksheet and practice more with all tricks learned so far. Print out and add these two Doubles Subtraction fact cards to your collection and use them regularly to help review and memorize these facts. After working through the above examples, try the four steps below to practice 2-Ladder as well as practice with all the other tricks. Print out and work through this worksheet which allows the questions above to be answered on paper.. Try the 2 Ladder worksheet that also has questions based on the Doubles, Backwards 1, and Number +1 tricks. Next, try this review worksheet to practice all the tricks learned so far. Use these eight math fact cards to review and memorize the 2 Ladder math facts. The workbook is for ages six and up, and has reproducible pages to help students learn the math facts. Addition and subtraction facts to 18 are taught in an original way that does not just rely on drill and practice. Facts are grouped and associated with easy-to-learn methods and tricks. The facts are introduced with a trick and then those facts are practiced by trick name with previously learned facts. After initial instruction, teachers/ parents can assign workbook pages for class work or homework to give children practice and review. Two Plus Two Is Not Five includes 232 workbook pages, answer keys, a certificate of mastery, and record-keeping pages. Designed for any age student, this National Best Books 2008 Award-Winning book focuses on teaching children strategies to remember the multiplication facts. There are 148 worksheets for written practice and review, and this workbook includes a guide to introducing the facts. You can read reviews of the workbooks here and you can buy them through this link. Susan Greenwald MA Ed. has degrees in special education from the University of Arizona and Arizona State University and she is an educator with over two decades of success teaching math facts and mathematics skills. Susan has written three math books directed at teaching mastery of the math facts and is a sought-after speaker and presenter. You'll find more about Susan and her work along with helpful advice on helping children to learn math on her math book web site.